These words are not mine but from Jon Traunfeld* as a reaction to the picture below and its description. “As you can see on the picture, Donna and I taught the GIEI gospel outside of Maryland. Today we were at the Inverness Garden Club in Inverness, IL, a northwest suburb of Chicago. For the record, the presentation was adjusted – I added Illinois Extension links and updated the first and last frost dates for the area where the presentation was given. Chicagoland has about a 4-weeks shorter growing season than we do here in Maryland. Everyone really enjoyed our seminar and the enthusiasm for the subject we bring. On the other hand, we are not the first ones to speak on behalf of the GIEI program outside of the Maryland/DC area. Mr. Traunfeld did it on the Martha Stewart show in March 2009 with the salad table. The entire 10-minute section of the episode is available here. By the way, once you return from your holiday vacation, take a moment to cheer for the 5 year anniversary of the GIEI program. The first blog post was posted on January 9, 2009. 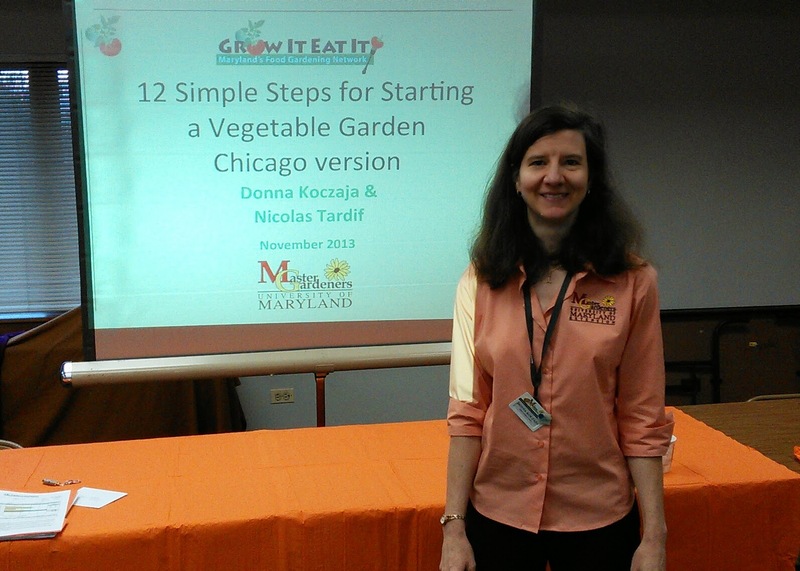 *John Traunfeld is a University of Maryland Extension Specialist, the State Master Gardener coordinator, director of both Home and Garden Information Center and Grow It Eat It programs.